Disclosure: I am P&G mom. As part of my affiliation with this group I receive products and special access to P&G events and opportunities. The opinions on this blog are my own. I’ve always hated washing the floors. I’d rather clean the fridge or do laundry any day vs. washing my floors with a mop and bucket. I dislike having to move the furniture and then put it all back and then waiting forever for the floor to dry. Plus, I always make a mess with the mop and bucket and there’s pretty much a spill every time. I do it because I have to and I value a clean home. Our home has vinyl flooring in the bathroom and office and I’ve ditched the mop and bucket and am now washing with the new Swiffer BISSELL SteamBoost. It’s safe to use on marble/stone flooring, ceramic tile, vinyl & lineoleum, sealed wood & laminate flooring. Our kitchen and upstairs bathroom floors will be ceramic tile when the renovation is complete. It’s a steam mop that works on getting rid of the dirt that mops can leave behind. It has a special Steam Pad that’s made with a steam-activated, dirt-dissolving cleaning solution that will deeply penetrate the dirty floor and make it shiny and sparkly clean. It’s beyond easy to put together. All the instructions for set up are right on the back of the box and there’s picture diagrams so you can see exactly the steps involved. It’s basically just snapping together the handle, applying the steam pad, filling it up with water and then plug it in and pull the trigger to activate the steam. Clean away! A little light comes on so you know its working and I could see the steam coming out the bottom as I was cleaning the floor. It has a nice, light and fresh scent. I like that there’s no special cleaning solution you need to buy. It works with the Steam Pads and plain ol’ tap water. It’s very lightweight and takes little effort to move around. I didn’t use it on the hardwood because the floors are waxed and it says to not use it on waxed wooden floors. However, once we get our kitchen and bathroom floors tiled, I’ll be able to try it on those floors too. For now, its working its magic in the downstairs bathroom and office areas. 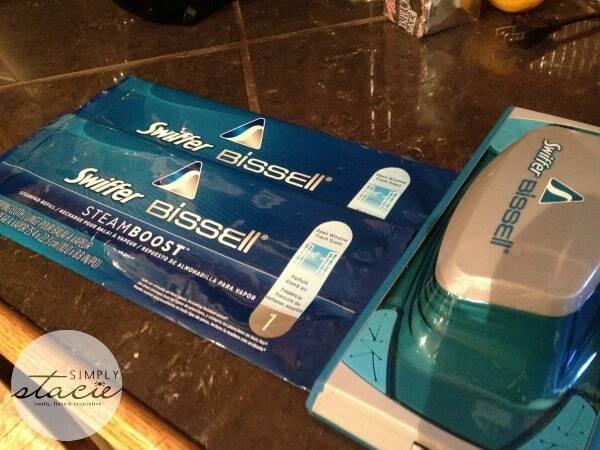 The Swiffer BISSELL SteamBoost retails for $49.99. Visit Swiffer to learn more and see where you can buy one for yourself. I’d clean the kitchen floor first. I’d take care of the front hallway first – then go, go, go from there! The ancient off white tiles in the front foyer. The first room I would clean is the kitchen. Bathroom – it needs a deep clean! I’d clean the kitchen first. I’d clean the kitchen floor first! I entered your fab giveaway. First, I would clean the kitchen floor. 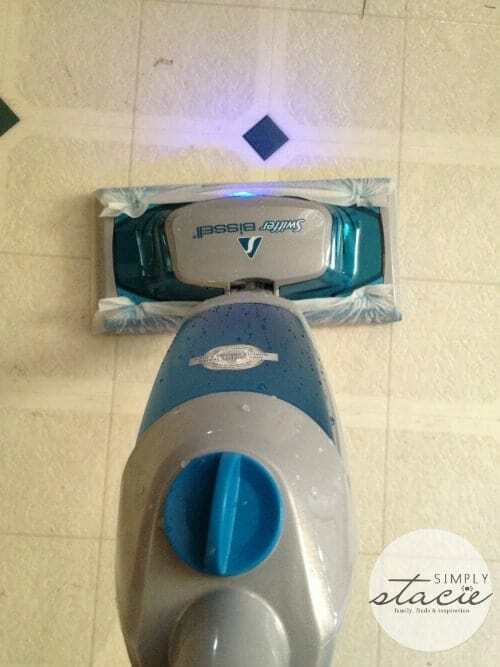 It would be great to win the Swiffer Bissell SteamBoost.